The Marketing Automation Software industry continues to be red hot and industry growth shows no signs of abating. While marketing automation is actually one of the three pillars of CRM software, it's generally the pillar that receives the least attention from most CRM software vendors. This has left an opening for specialty players such as Eloqua, Marketo, Pardot, HubSpot, Silverpop, Infor and others. In fact, as Gartner now predicts that CMO's will control more IT budget than CIOs within the next five years, there's a new push by both traditional CRM software vendors and the marketing automation system pure plays to capitalize on this growing opportunity. Not surprisingly, this growth market has resulted in a fragmented marketing automation software supplier landscape where leaders are few, change is inevitable and the distance between leaders and followers can grow or fall quickly. Act-On Software may be the newest marketing software vendor to challenge the current crowd. The company is only four years old, but is aggressively staking its place in the market—a place that it defines as the Fortune 5 million, but our analysis more aptly suggests is the North American small and midsize business (SMB) segment with less than 5 marketers, and in reality, probably one or even less than a full time marketer. 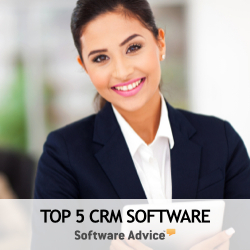 But don't confuse Act-On's SMB focus with low-end marketing software or the traditional CRM marketing management software. Act-On Software delivers the core lead acquisition and lead management features not available in almost all CRM software systems. The company's growth is inspiring and as of early 2012 the company clearly shows that it has begun to hit its stride. For Q1, Act-On Software revenue grew approximately 350 percent year over year while the company increased its employee count by over 200 percent to 105 staff. The company and the solution are young and while Act-On Software doesn't yet offer several of the advanced marketing automation features available from more mature competitors, the company is publishing updates as few as every two weeks and quickly advancing this solution. To better understand this marketing software solution, its opportunity in the marketplace and its position relative to the competitive market, I published the Act-On Software review. As with all marketing automation software reviews, this analysis is independent and objective and seeks to deliver the balanced positioning marketing software buyers are looking for when educating themselves before making a purchase commitment. As long as the mainstream CRM software players continue to limit marketing automation to campaign profiles, simple segmentation, email blasts and reporting, they will leave room for the marketing automation software specialists to deliver far more powerful capabilities such as digital lead tracking, online lead acquisitions, lead scoring, sophisticated email marketing, nurture campaigns, complex lead transfers and powerful marketing analytics. The separation between CRM software and marketing automation software providers won't last and it's inevitable that the two will morph. However, until the consolidation process picks up steam with a few key CRM vendors leading the M&A effort, vendors such as Act-On Software have plenty of upside opportunity to grow their businesses and challenge the still fluid leadership positions in the marketing automation software industry. Don't confuse Act-On's SMB focus with low-end marketing software or the traditional CRM marketing management software. Act-On Software delivers the core lead acquisition and lead management features not available in almost all CRM software systems.